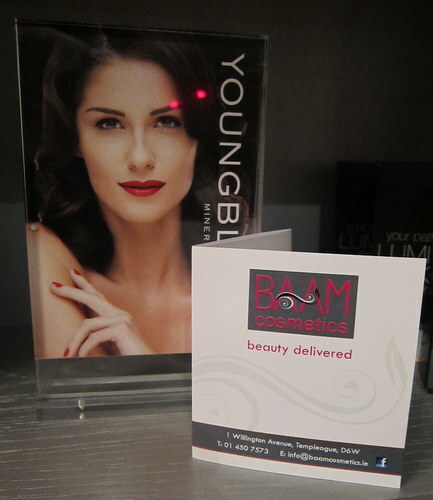 BAAM Cosmetics launch in Ireland: Young Blood Mineral Makeup, LaLa Lashes, One Minute Manicure and more! 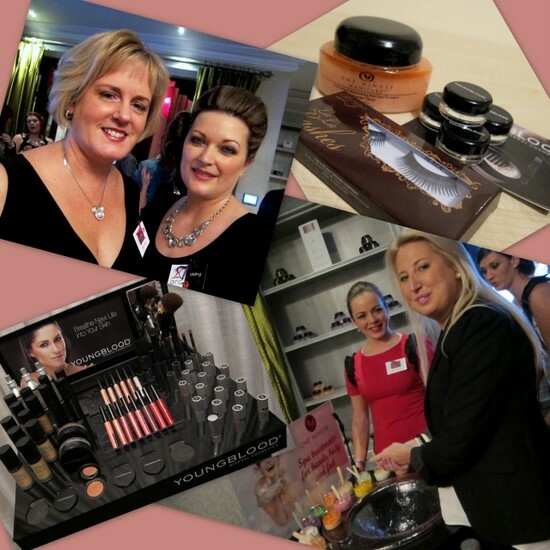 BAAM Cosmetics recently burst onto the Irish beauty scene with a glitzy launch event in Dublin’s five star Dylan Hotel. Champagne cocktails were flowing, the nibbles were to die for and the guests, who included leading Irish makeup artist Derrick Carberry and stylist Cathy O’Connor, oohed and aahed as they tried out some of the available product lines under the BAAM umbrella. These include Lash Perfect semi permanent eyelash extensions, LaLa lashes (strip lashes), Young Blood Mineral makeup and the One Minute Manicure range. From top left: Anne Woods, MD of BAAM Cosmetics, with Aisling from Arc PR; goody bag contents including a One Minute Manicure scrub, LaLa lashes and samples of Young Blood Mineral powder; the lovely Allsun trying out the One Minute Manicure range. There was a sink set up for guests to try out the One Minute Manicure scrubs which were, in a word, amazing. Jennifer Aniston, Renée Zellweger and the Beckhams are apparently fans and no wonder: these are packed full of dead sea salts and essential oils; rinse off the product and your hands are left super soft, smooth, and smelling fantastic. At €20 these would make great gifts: there are 13 different fragrances which include Mint Classic, French Vanilla and, my personal favourite, Lemon & Lime. We also got to play about with some Young Blood Mineral Makeup, which is said to be one of the highest quality mineral ranges on the market with celebrity fans including Cheryl Cole, Denise Van Outen and, erm, Pamela Anderson (but don’t hold that against them!). I was particularly taken with the Lunar Dust powder which would make a lovely highlighter. The range isn’t cheap – prices start at €21 for a lipstick and go up to €42 for foundations and eyeshadow quads, and €43 for the eyebrow kit - but results seem impressive. The brand was recently featured on Xpose. I’m also looking forward to trying out some LaLa Lashes – these cost €10-11 and come with their own adhesive which I’m informed is of a high quality. We got a pair to take away in our goody bags, so I’ll report back soon! The website is currently under construction but for more details on BAAM Cosmetics, including stockist details, check out the Facebook page. Sounds fab, would love to know more about that Young Blood range, will you be reviewing some of their stuff? Off to check out their Facebook page! OOH - these sound lovely and the Dylan is such a great place for a glam launch ! @Roxy, I only have some samples of the mineral foundation to try but I hope to try & review some of the other products down the line! @Joanne, LOVE the Dylan, it's fab! @Tiffeny, which products did you try? Totally jealous. I would love to have gone to this event! It sounds like so much fun. Thanks Bonnie, it was a lovely way to spend an evening!